The work reveals the highest microplastic pollution yet discovered anywhere in the world in a river near Manchester in the UK. It also shows that the major floods in the area in 2015-16 flushed more than 40bn pieces of microplastic into the sea. Microplastics include broken-down plastic waste, synthetic fibres and beads found in personal hygiene products. They are known to harm marine life, which mistake them for food, and can be consumed by humans too via seafood, tap water or other food. The risk to people is still not known, but there are concerns that microplastics can accumulate toxic chemicals and that the tiniest could enter the bloodstream. The team analysed sediments in 10 rivers within about 20km of Manchester and all but one of the 40 sites showed microplastic contamination. 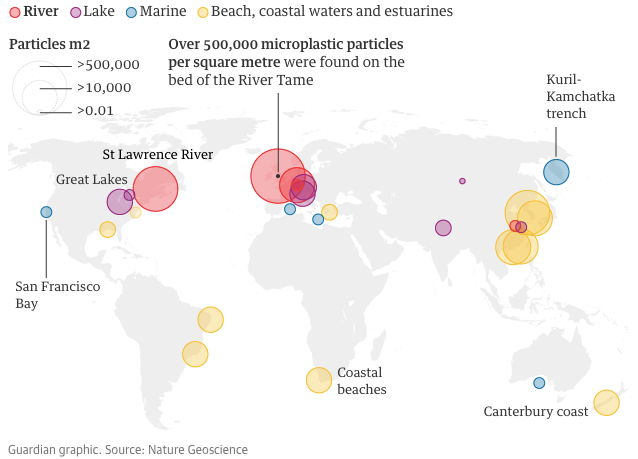 After the winter floods of 2015-16, they took new samples and found that 70% of the microplastics had been swept away, a total of 43bn particles or 850kg. Of those, about 17bn would float in sea water. “This is a small to medium sized catchment in the north of England, it is one flood event, it is just one year – there is no way that [5tn global] estimate is right,” said Hurley. The researchers said total microplastic pollution in the world’s oceans “must be far higher”. The worst hotspot, on the River Tame, had more than 500,000 microplastic particles per square metre in the top 10cm of river bed. This is the worst concentration ever reported and 50% more than the previous record, in beach sediments from South Korea. “There is so much effort going into the marine side of the microplastic problem but this research shows it is really originating upstream in river catchments,” she said. 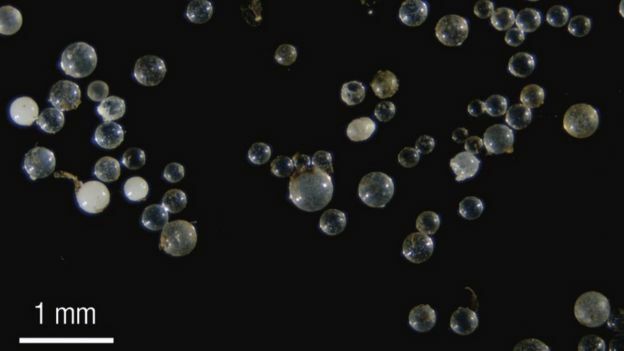 About a third of microplastics found by the team before the flooding were microbeads, tiny spheres used in personal care products and banned in the UK in January. This high proportion surprised the scientists, who said the beads may well also derive from industrial uses, which are not covered by the ban. 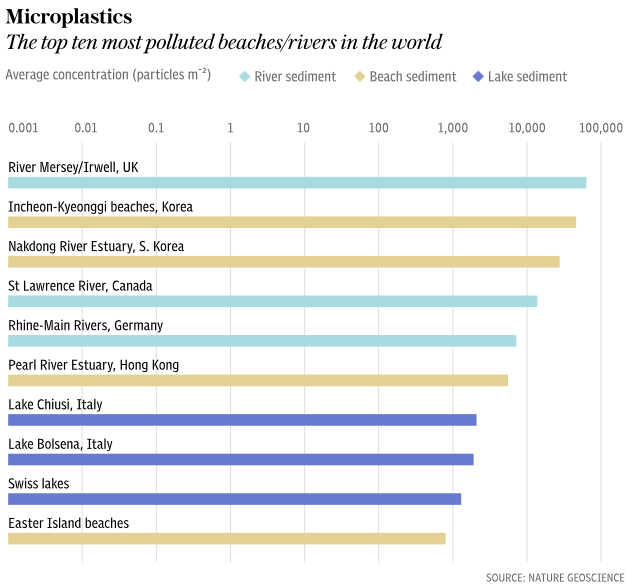 Erik van Sebille, at Utrecht University in the Netherlands and and not part of the research team, said the work does support a much higher estimate of global microplastic pollution in the oceans: “I’m not surprised by that conclusion. In 2015, we found that 99% of all plastic in the ocean is not on the surface anymore. The problem is that we don’t know where that 99% of plastic is. “It is very difficult to tell how this plastic may be affecting us,” Hurley said. “But they definitely do enter our bodies. The smallest particles that could be analysed in the new research were 63 microns, roughly the width of a human hair.